“Howard can you write somethiing about breathing? Breathing is a complicated issue. I know to some it seems simple…breathing is an involuntary action without which we would die. So, allow me to rephrase, Parkinson’s breathing is a complicated issue. From a Traditional Chinese Medicine perspective, our organs work as organ systems with a yin (passive) and a yang (active) organ. Regarding breathing, I look to the lungs (yin), but I also look to see how the large intestine (yang) is doing in the organ system. Also, this system impacts the skin and is associated with the emotion of grief. Many Parkinson’s sufferers face the issue of constipation. This is a large intestine issue that could negatively impact the lungs, the skin and the emotional balance regarding grief. I know it did with me. Deep breathing was difficult. Regarding my skin, from December 2009 until I recovered, I lacked outer skin feeling — I did not feel someone’s touch on the surface of my skin, I did not feel mosquito bites, or cuts, or burning my hand on the stove, or hot water doing dishes, or hot water in the shower. One of my greatest pleasures in recovering was holding Sally’s hand and actually feeling it. I got chills just like the first time I held her hand 23 years ago. And the emotion of grief. Yes, it is very difficult to have this disease and not grieve over our daily misgivings. That was a constant battle for me. However, it caused me to re-focus my energy on keeping faith and moving forward. Just because we understand that anger and frustration and fear and worry and grief all are detrimental to recovery does not mean that these little demons do not show up to play every day. That is where faith plays a big part. 1 Faith trumps 100 Demons. Let’s circle back around to breathing. In Not Always So, Shunryu Suzuki suggests starting with an exhale…exhale like it is your last breath before you die, he says…if at the end you have an overwhelming need to inhale, then you still are alive. I laugh every time I read it. If you are having a difficult time taking in a large breath, this method will certainly force your system to comply. Another way he discusses breathing and exhaling first is in how you view the process. He says, first exhale to blow out all of the toxins and impurities, then you are ready to receive a breath of the world’s nourishment. Instead of “taking” a breath or air, you are “receiving” Mother Nature’s nourishment. I like these ideas and practice them, but they are not where I started. I started with the basics. Breathe in, breathe out. Repeat. Here is a method to assist with bringing in the most amount of oxygen possible. Lay on the floor on your back with your knees bent and feet flat on the floor. This should have lowered the small of your back to the floor. Place one hand on your chest and one on your navel. Inhale slowly and see which hand rises. If it is your navel hand, you are breathing into your diaphragm and you are in good shape for deep breathing exercises. If it is your chest hand, you need to practice. When I first learned diaphragm breathing, I would push out my stomach prior to the inhale and try to direct the airflow down to my expanded stomach. With Parkinson’s, rigidity will fight this, so be patient. 1. Inhale deeply for a count of 4. 2. Hold your breath for a count of 4. 3. Exhale for a count of 4. 4. Hold your breath for a count of 4. If you can do this set of breathing four times in a row, it should go a long way to helping with the breathing issues you are facing with Parkinson’s. By the way, until I fully recovered from Parkinson’s, my outer skin feeling was non-existent. Be strong, keep the faith, heal from deep within. And don’t forget to breathe. 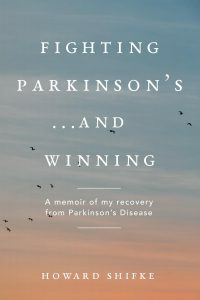 REMINDER: On March 9, 2011 at 6:00PM EST (GMT -5) on Parkinson’s Blog Talk Radio, I will be interviewed for 90 minutes regarding my Parkinson’s philosophy and Parkinson’s recovery, http://www.blogtalkradio.com/parkinsons-recovery/2011/03/09/help-for-persons-currently-experiencing-the-symptoms-of-parkinsons-disease. I hope you will tune in. This entry was posted in Fighting Parkinson's Drug Free and tagged and breathing, fighting parkinson’s. Bookmark the permalink.